The other day I read this post by Oestrus over at World of Matticus called Keeping Up With The Paragons. It touched on something that I’ve been thinking about pretty much since launch. It’s easy at this point in the expansion’s life to feel as if you are getting left behind, will never accomplish what you want to accomplish – or if you do, it’ll be so long after the fact that it’s irrelevant. It’s not true. The expansion just came out – approximately yesterday! Really. You have to dive in at your own pace, not the pace of everyone around you. Not everyone is going to have server firsts, or world firsts – in fact, I think the majority of us are comfortably someplace in the middle. The guilds that are blowing through content like tissue paper are impressive, but they make sacrifices and commitments to be there. That’s not a criticism, it’s a fact. Finally, the content isn’t going to go anywhere. You still have time. It’s okay if you aren’t raiding yet, honest. The expansion has been out for twenty-eight days, or exactly four weeks. Of those days, depending on your beliefs – at least three were likely holidays. (The twenty-fourth, fifth, and first of January, for anyone keeping track). That leaves you with exactly twenty-five days that you could have been playing WoW, but I’m probably being generous there. In my case, my brother was here from out of town for Christmas. I don’t see him more than once a year – and the once is if I’m lucky – so I sure wasn’t going to be playing WoW in the evenings when he was here. Several of our guild members had other obligations; travel, family, holiday. One of them moved across the country in the middle of December, a few more went home to another state to celebrate the holidays with their families. I’m not here making excuses. (“Oh, we absolutely would have been server-first at xyx if only we’d had the time!“) But the fact is, the expansion is still quite young. Presumably most folks had to attend to that pesky work-thing for a good chunk of December. I know that being behind the leveling curve can be frustrating. I started playing WoW pretty late in Burning Crusade, and it felt like an eternity before I could catch up to play with the “big people.” When Wrath came out, I was bound and determined not to be left behind, and I wasn’t. This time around I’ve been much more relaxed. I leveled at what I consider a reasonable pace, and my reasonable pace is probably different from yours. 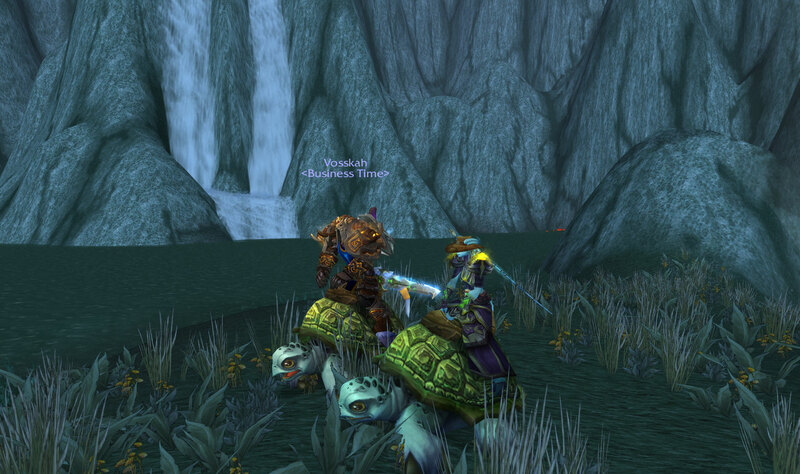 At least two guildies were 85 quite literally overnight. I wasn’t among them, but that’s okay. We’re all going to be raiding at the same time. 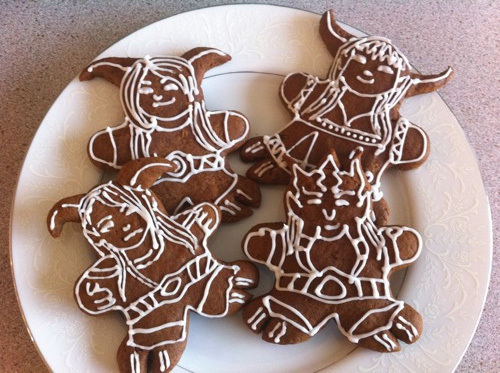 In my world, Gingerbread Draenei Cookies > Blackwing Descent, if only for the month of December. Expectations and Priorities: We can’t all be first. Not everyone is going to be first, even though the competitive WoW culture is a bit obsessed with it. It can be nice to compare yourself to other folks to see how you measure up, and can serve as a form of recognition for the effort you’ve put into your character and the game. But it’s important to recognize that those kinds of achievements require a sacrifice. To use myself as an example, we could have pushed the guild harder to be ready on time. I could have made sure to run more heroics over the holidays instead of going out for supper (and sushi lunch!) with my brother and my family. I could have done that, but I didn’t want to. I’m not passing judgment on people who would have made a different choice – I’m not in their shoes! Maybe they don’t celebrate the holidays, or their family was out of town. I can’t possibly know that. I do know that I’ve chosen to be in a guild of people who are adults. They have children, jobs, and other obligations. We’re also a small guild (by choice) and so we have to wait for our full roster to be ready before we can dive into ten mans. I know some twenty five-sized guilds have been able to work on tens. They have a “head start” on us, and that’s fine too. We expected to start raiding in early January, and that’s what we’re doing – right on schedule! I know a few of our members would’ve preferred for us to start sooner, but the sacrifice didn’t seem worth it. We have a great group of excellent raiders with real-life obligations that prevented us from raiding sooner, but we know that when we do raid we’ll be ready. One ill-fated Blackwing Descent evening back in mid-December proved that. Gearing, gemming, and enchanting don’t happen overnight. The only possible problem is when your expectations and those of your guild don’t match up. In most cases, I think that if you wait a month you won’t be disappointed. 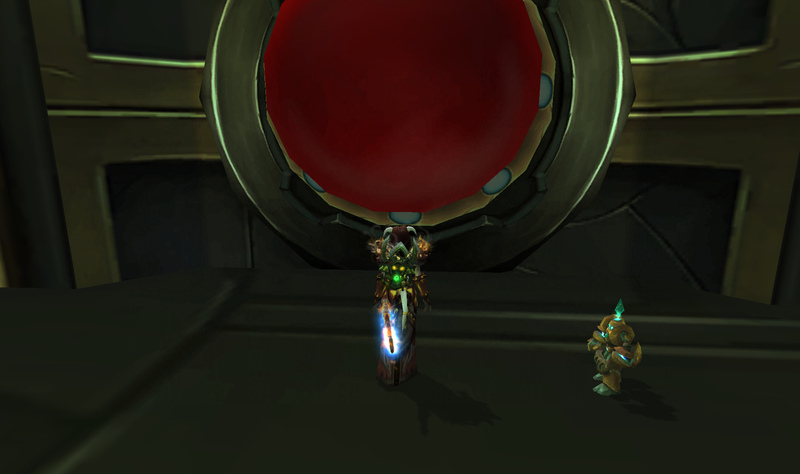 Everything feels very urgent right now, but raid progression will settle as we all get a chance to get to it. Inevitable End: This, too, shall be patched. Regardless of when you start, if you have the will and the people to make it happen, your raiding will be successful. What successful means is something only you can decide for yourself, and don’t let the accomplishments of others cast a shadow on your own. Congratulate your further progressed friends (sincerely!) and rest assured that your time is coming. That tortoise knew what he was talking about. Hey, never understimate the benefits of fishing for your guild and raiding! That's something that has to be done slowly.